Pippi went to the groomer last week, to get a new look. We are changing her cut just a little, the little gal wants to keep with the times. Her ear tufts are much shorter now, her brows to short and chic points and her beard a bit more kept. Her furs are fairly easy to keep looking swell, just take a quick brush to put her beard into place. I’m not trilled with the cut, the took off way too much and she has “snail-skirt”. Her tufts are nearly gone, I will be much happier in a few weeks I’m sure. 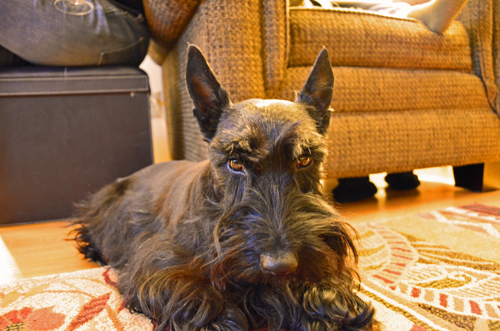 This entry was posted in Pippi and tagged dog grooming, Scottie, Scottie dog, Scottish terrier. Bookmark the permalink. Pippi looks beautiful (even though she’s giving you the stink face)! You are looking good there Sis. It always takes a week or for us to look our best though. Have a great day!! Is she frowning about her cut? Cute girl. She needs to come see Jake and Albert. They prefer the more unkempt look of true mountain men for themselves…heehee. I was just noticing how much her eyes are like Jake’s. Albert’s are more like round black marbles, but hers and Jake’s have that warmer, more soulful color. Her eyes are very brown and round. She doesn’t look all that thrilled about it either. Poor Killer Dog. We get clipped but are left with longer hair. SHE can never get the ears right, ours are usually fuzzy….and sometimes wonky. Doesn’t take long for mistakes to grow out though. Pip, we thing you look beautiful. A bee-you-ti-ful gal no matter what the cut and a fabulous photo! Oh she doesn’t look very impressed!